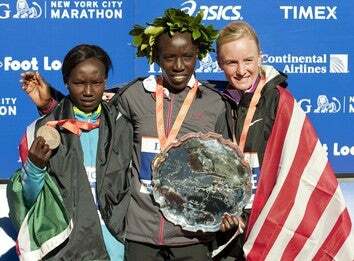 American Shalane Flanagan and Kenyan Mary Keitany ran their first marathons today, and the two women were able to finish in second and third place, respectively. But did you know that until fairly recently, women weren't allowed to run marathons? Distance running was viewed as not only unladylike, but also physically dangerous to women. One popularly held belief was that distance running could endanger future babymaking abilities, and after the 1928 Olympics (when several competitors collapsed after the 800 meter dash), distance running was closed to female competitors. Women occasionally ran in marathons as unregistered competitors, numberless ciphers next to the men whose names history recorded, but in 1967, a 20 year old college student named Kay Switzer decided to change that. She registered to run the Boston Marathon under her first and middle initials. When race officials saw that "K. V. Switzer" was in fact female, they tried to physically remove her from the race (more on that amazing story can be found here). Switzer continued running and finished the event in 4:20 and later went on to win the New York City marathon in 1971. The women's marathon wasn't even an Olympic event until 1984, when American Joan Benoit-Samuelson took the gold. Flanagan pulled away from Keitany, 28, over the last mile, and after finishing she dropped to her knees and kissed the ground, an American flag covering her back and shoulders. Flanagan not only nearly won her first marathon, who also won her first United States women's marathon championship, which was contended in the race. When asked what she was planning on doing next, Flanagan told reporters that she planned on going on vacation and having "a burger and a beer." Warning, Shalane: I just finished my first marathon a month ago (finishing not even close at all to second place) and right afterward, one beer will get you pretty silly. You probably want to chase it with some water. Enjoy the moment, ladies, and everyone who ran the marathon today. You deserve it.